Pretty Things: Welcome to the 5th Bead Soup Blog Party! Wowwwwwwwwwwwwwwww! As I knew your a hard act to follow! Beadalicious Heaven! You are amazing & ur designs are exquisite! Zipper pulls are even sweet! No favorites cause I luv them all! Especially the earrings! TY Lori for everything & I luv ur design vibe! Lori, what a beautiful plethora of pieces! I'm going to have to come back again (and again!) to appreciate all the lovely details you put into all your soups. I love the way the riveted focal turned out too. Good for you for being brave! Your designs are soooo beautiful! And varied, too. Great job on that rivet and not cracking the stone!! Lori, you are an AMASING!!! I am so happy for an opportunity to "meet" you. Your work.....cannot pick a favorite, each piece unique, inspirational...THANK YOU very much for your hard work in organizing blog bead soup parties!!!! OhMyGoodness Lori, my head is SWIMMING form all the wonderful things you made out of those two soups. I am particularity fond of the first piece and the one with the three leaves (that you said didn't photograph well. . .pshaw). Though. . .they are ALL fantastic pieces!!! I can't believe you got so much done on top of organizing the whole hop and dealing with health issues. You really are an amazing lady. Thank you for doing the party and really being an awesome example in this community. While your jewelry is beautiful, YOU are INSPIRING!! I love the combination of copper wire-work with the jasper focal. I think that piece is my favourite but they are all wonderful. That is enough soup for an entire state! Each piece is amazing, I can only hope to reach this level some day! 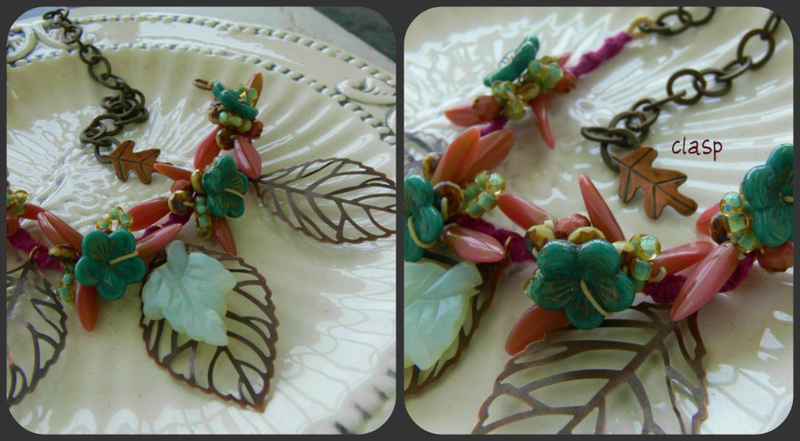 My favorite is the necklace with the lace in the frame, and the earrings with the pale green lampwork beads. I am going to have to come back and drool over these! 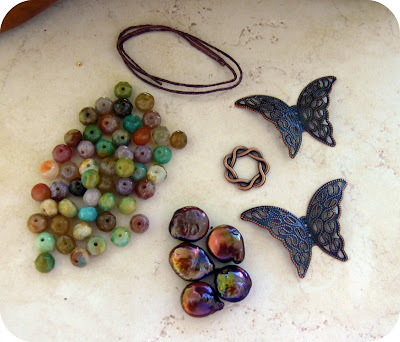 Lori, what an incredible post...and we'd expect no less from the Queen of Bead Soup! 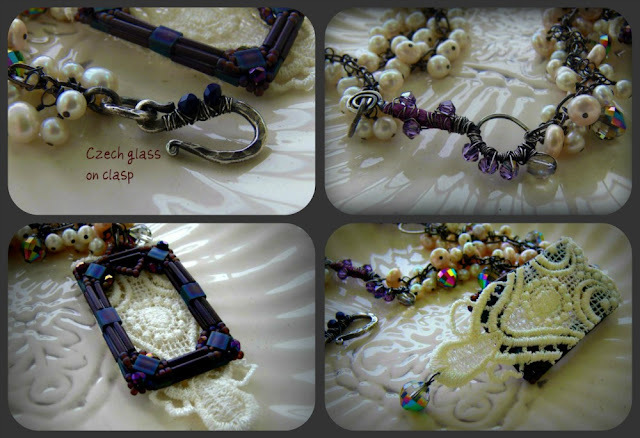 I am really amazed at the range in designs that you created from Marcie and Rebecca's bead soup mixes... absolutely beautiful... from zipper pulls and earrings to show-stopper necklaces! Can't pick a favorite, I'll have to go back and look again - they are all so pretty. Thank you for hosting another tremendously successful and fun BSBP!! OMG, Lori - I am speachless! Naturally you went above and beyond above and beyond! 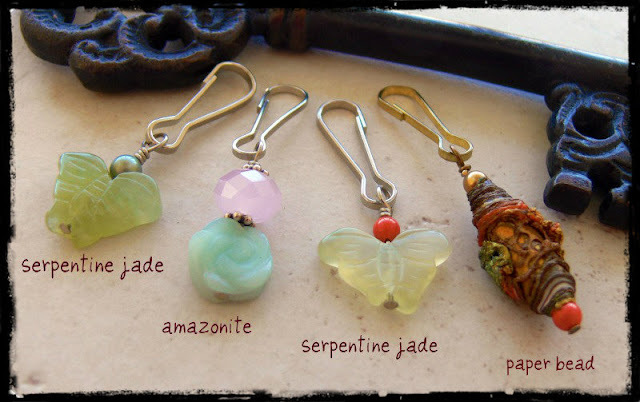 My faves are the Tibetan necklace and the amazonite & leaf earrings. But I also liked the dotted daggers on the ends of the green macrame, and the vintage beady goodness of the first two necklaces. And there was a bracelet in there I loved a lot too. 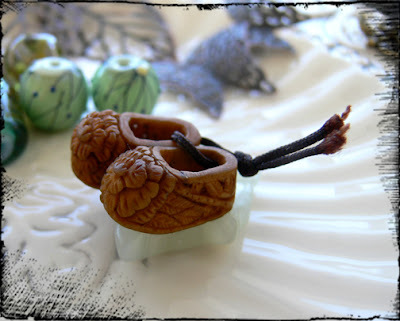 Those wooden shoes are precious :D This has been so much fun Lori, thank you! Oh, Lori! How fabulous. You sure put all your soup to work in beautiful designs. I can't sleep so I figure... why don;t I hop around the world, looking at lovely creations. So enjoying this! Woah! I'm fired up just looking at all the work you did. Totally awesome, each and every piece. 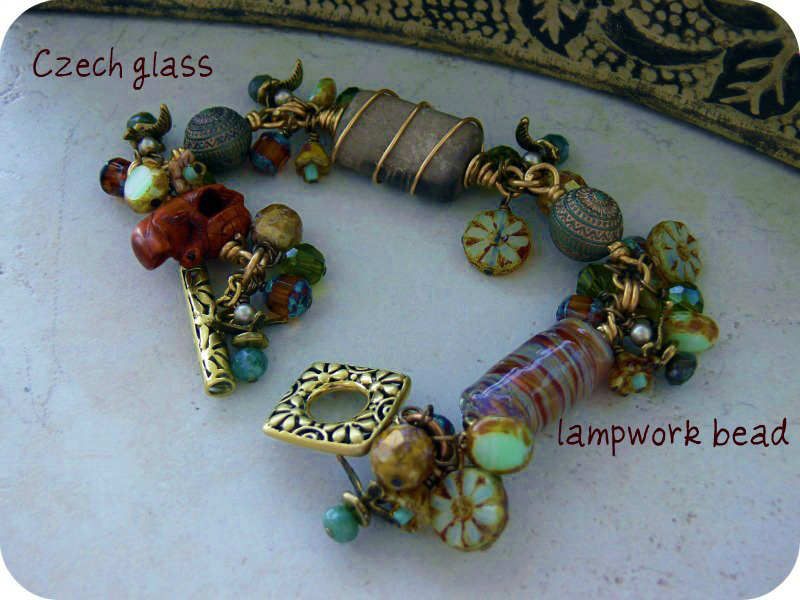 My fav is the necklace with the green lampwork bead. You obviously don't need a lot of sleep! Nicely done. Thank you so much for putting this on. It's my first bead soup and I truly loved participating and am loving hopping! OMG! Lori! I knew, that you'll make many things from your soups, but that much? Wow! oh my goodness--the eye candy just kept coming! i love all the unexpected touches, and the butterfly earrings are super cute. you have outdone yourself! Lori! I just love all the pieces you made! these are great, you're creative! Although it was too late to join when I found out about the 5th BSBP, it is great to see so many artists hard at work and producing such lovely beauties. 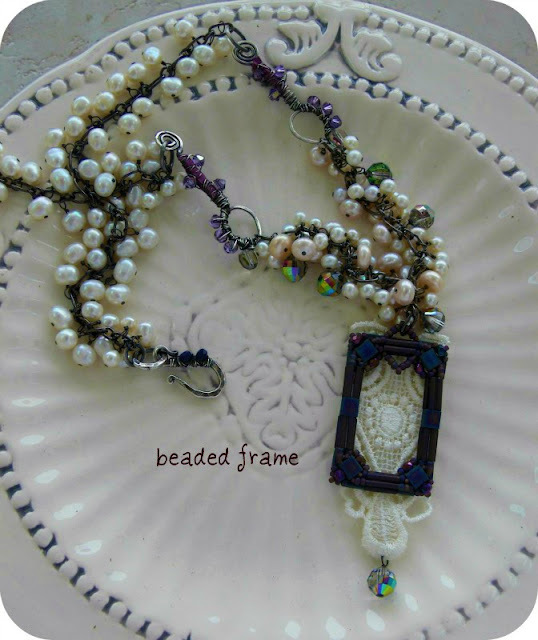 I love what you did with the beads given to you, especially the rectangle beaded frame. The details u have given to your creations were exquisite. The necklace with the brass leaves is beautiful too. I really love how the gathered beads cluster together. Very pretty and interesting. First Lori, Thank you for such a well organized and fun Blog Hop. I am amazed at all that you made for the blog hop. I absolutely love the way you put the lace into the beaded frame from Marcie. All your pieces are gorgeous.I am also very taken with the copper piece you textured behind the focal. Great color combo. Firrst of all: Thank you, thank you, thank you, thank you, thank you for doing it again. Love you Lori! Now on to the pieces - divine! Just divine. And what a clever use of the knotting technique. I never thought of this. So cool. That piece is my fav of all those pretty, pretty pieces you made! OMG! These are super gorgeous! You are truly the BSBP Diva, Lori! Your color combinations are outstanding. Each one is so special with its own little surprise detail. thank you Lori for all your hard work and keeping this so organized. Brilliant things you made from your soup Lori! Loving all of the things you made. The zipper pulls are a lovely idea. OMG! You give a whole new meaning to BEAD SOUP PARTY and so you should. What a collection of wonderful, mouth watering goodies. Everyone one of them so well thought out and made. Just love them all! What an array of lovelies! I don't know how you managed to put all those pretty pieces together AND coordinate ths blog party, all while experiencing so much physical pain. I love how the brown necklace turned out. And those zipper pulls were a great idea to use up spare beads. I agree with Shanti. You are amazing! Every design is beautiful and really brings out the special character of the beads. Thanks for all the hard work you put into the Blog Party! You rock!!! Oh my! All those beauties! I think the bracelet from Rebecca's soup is my favorite but all of them are amazing! wow Lori, you made a great work! Thanks for hosting...your creations are stunning, your work inspiring. OMG!!!!!!!!!! Are you ever without inspiration?? WOW... you did an amazing job. Hot dang Lori! You are one prolific soup chef! Your pieces all turned out great! I must say the first is my favorite. Love the colors and romantic feeling of it. Thanks for another great exchange. Lori, I'm SO glad to see you jumping back into the creative soup! Your creativity and imagination are amazing-- I am gobsmacked by how well you worked with what your partners sent-- absolutely stunning pieces, every one! I am humbled by your creativity and skills! I will be referring to this blog for awhile to learn from it. Thanks for sharing your skills and time with us by making this party happen! Amazing. But then you had amazing ingredients to work with. I am in love with the HUGE Swarovski crystal. I love that you were able to create soooo much. If this is what you create when you're not feeling well, I can't begin to imagine what a juggernaut of creativity you are when you're at peak form! These are absolutely beautiful!!! What a variety. You never cease to amaze. A huge assortment and well done. All the earrings are fantastic! That triangular toggle is beautiful and I loved what you did with it. Great work. Can't wait to see all the Soups!! Lori, you out did your self!!! I blogged about why I won't be able to comment on every creation. But, I will be visiting the blogs!!! Wow Lori! I don't know where to begin. I need to read this again (after coffee). There are just too many pieces I like for my brain to retain and comment on. One quick comment - for not liking to work with warm colors, you sure nailed that necklace with the copper leaf. I totally love it! I will be back. OMG! I read your post last night, but held off commenting until this morning ... just so that I could revisit the amazing pieces you created! It would be impossible to comment on each piece individually, as I truly believe you put your heart and soul into EACH piece and created little works of art along the way. I must say, however, that my hands hurt just thinking about ALL THAT FANATASTIC WIRE WRAPPING YOU DID! Also - I MUST MAKE ZIPPER PULLS! They are so cool! Thank you so much for hosting this party - I sincerely hope you are feeling better, lickity split! Lori, I'm just starting hopping around. My goodness, you are a jewelry-making mad woman! I love everything you made, and marveled at how you jumped right in even though some of the colors were not what you normally used. Thanks for hosting this fabulous bead soup! Lori your Bead Soup turned out amazing!! I love all the pieces. They are all so unique.!!! Lori! What gorgeous pieces of art!! You sure have been a busy and creative gal! Lori, as usual so creative with everything -and you had a lot of "everything" to work, oops I mean play , with. Always good color sense, and you were out of the box. I think those wire wrapped earrings impressed me the most - all that detail. I don't know how you worked all of this into your overwhelming life and schedule either. Good show! Wow, you left the stage with a whole desk full of wonderful pieces. Love them all! Stunning work. I can see it broadened your palette. That lace necklace made my eyes pop out of my head. In love with that piece. Wow, you were one busy lady! Its really cool that you tried out new techniques, or things, like the rivets, that you had limited experience with. Your work is wonderful! Thank you for hosting this fun blog hop! Now you can sit back and enjoy it! Oh wow!!!! Each piece is sooo pretty and unique! Great job on the pieces, AND the organization of the blog hop! ALL your creations are stunning, Lori!! I would never have thought to create zipper pulls...charming!! Thank you so much for all your hard work and putting this amazing swap together! Lori - WOW!! You are amazing to have created so many soup pieces - so much detail. I love your cluster work. I just know your book is going to be a best seller. Cindy did a stellar job photographing the dishes. You should be so proud!!! Wow! You had your creative mind in overdrive! Love what you did with the different pieces you had to work with. Will be back to check out what the others created. Lori, you knocked the soup out of the park! I absolutely love the very first piece--the way you used the pearls, and what you did with the lace behind the frame! Very vintage looking. And then the hoop earrings! 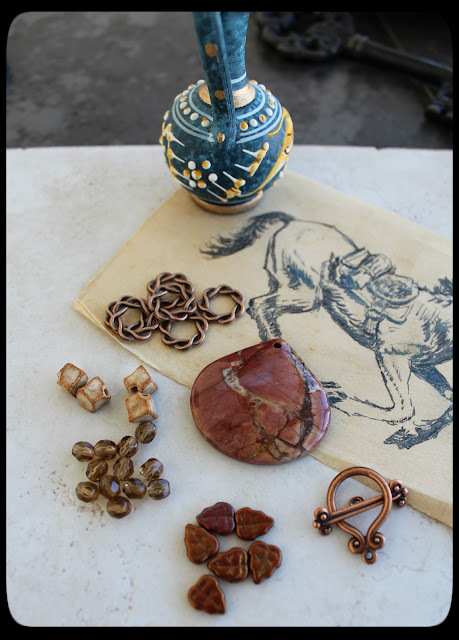 (I have to learn how to wrap like that...) I love how your pieces look antiqued. And the one with the jasper focal is delish--those ropy rings are awesome, they look fabulous there. And the bracelet with the Ojime bead is just lush--love the glowing brass with those darker beads. Gorgeousness! Wow doesn't begin to express how totally awesome this is! I can't wait for your next one so that I may play too. PS: I would have kept those awesome shoes too. Wowza! There is no way I could pick a favorite! So much and all fantastic! Those shoes!! precious! Great work and so much work! Thank you for all your efforts for such another great event! That is just fabulous! ALL of it! I love how you tried to use every bit of soup you were given and created soooooo many great pieces! I can't even begin to pick a favorite, the colors are terrific. The mix of metals and wire wrapping is gorgeous. Great job!! Great pieces. Great Bead Soup Hop. I've had to do a speed hop thru the first 90 soupers and will need to go back and review each one again. Thanks for organizing such a great event. This is why I started a blog! Looking forward to getting into the next one. Wow...you really did go wild! Beautiful stuff, Lori. Thanks so much for hosting! wow! A lot of fabulous creations. I love what you made. You have been a busy woman!! I like all of them, but if I had to pick a favorite, your first necklace is to die for! I've had SO much fun this time around...can't wait til next time!! Lori, Your talent is inspiring! I love every piece! You have such a creative and diverse mind! It is wonderful to see someone using their true gift and sharing it with the world! Thank you for creating this Blog Hop, inspiring others to reach beyond their comfort zone..for being a creative leader! I love your blog hops and even though I don't participate, I look forward to the reveal date with much anticipation. You have outdone yourself with your creations this year. 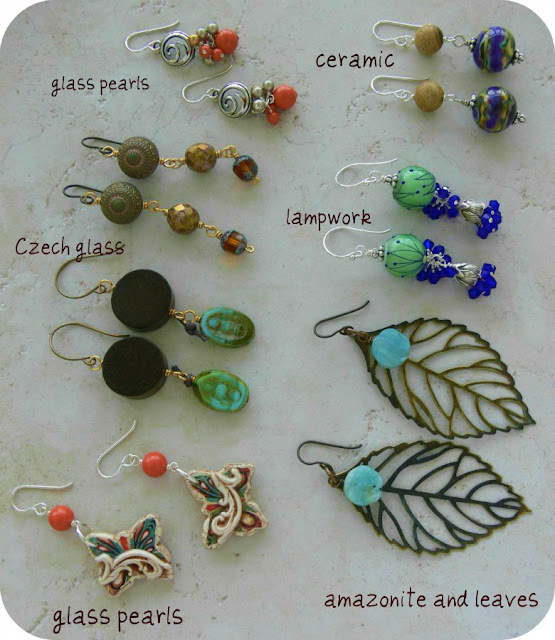 Love them all, but extremely partial to that earring wardrobe! I cannot wait to be in the next Blog Hop! I will post about this one today!!! Lori, your pieces are stunning. I just had my breath taken away! all love jean! I love everything you created. I really need to come for lessons! The way you blend everything has me starstrucked! You've been busy! I love the frame how cool! Wow! All of your pieces are stunning! Thanks for hosting such a great party! Amazing pieces! You were able to do so much with all the beads. I am so glad the you organized this bead soup party! I just got started into this addiction of jewelry designing. 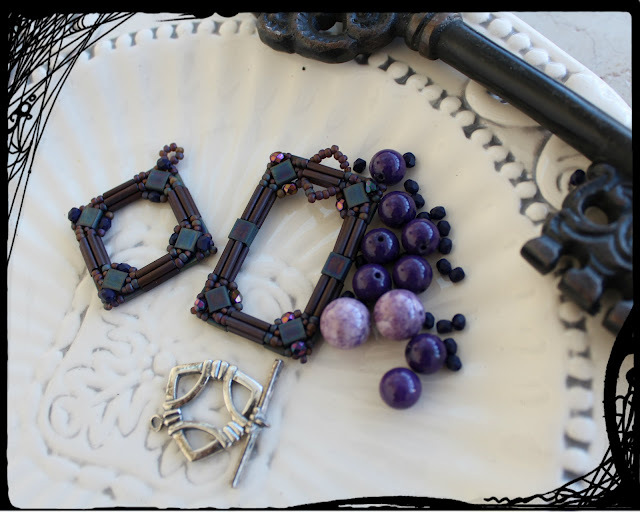 It has been great seeing the pictures of just the components and then seeing them all put together into jewelry pieces! Miss Lori! You've got the whole jewelry store there! Simply amazing. Creativity oozes from your pores. Definitely a hard act to follow. I'm happy though that you found some of the soup items a challenge! Wonderful designs! Each has your special touch and I am so glad to see you able to create through such pain and difficulty in your life. Hey Lori, first I want to thank you for hosting such an amazing undertaking and fun event. I know how much time goes into this! Now, you pieces are just stunning! You definitely have an eye of bringing together all different kinds of beads and components and creating something that is a beautiful piece of jewelry. Dang you were a busy girl! I am not sure if I can choose a favorite. It would be unkind to all the beautiful soup you got! Each piece is so you and very creative. Nice job. Wow Lori! Your designs are gorgeous. Breathtaking...is the best word to describe how looking at your creations made me feel. Each piece has it's own unique style and beauty. The lace addition of the first piece is really beautiful. The bracelet with the copper and teal won my heart. And all those gorgeous earrings!! You have been one busy girl, Miss Lori! Really, really amazing work. You are such a creative inspiration! Wow, you really did it!!! Thank you so much for making this real, Lori. It was so much fun for me to do the jewelry. I'd love to be part of the Bead Soup Community again, next time!!! thanks so much for all you have done!! You did good with your soup. Ingredients were seasoned well! Would hate to choose a favorite!! It was so great to see all your projects. They made up an amazing buch of jewelry! Love them all! Great job! Kisses Maria from Hungary! All of your pieces are beautifully, fabuloslly, gorgeous! 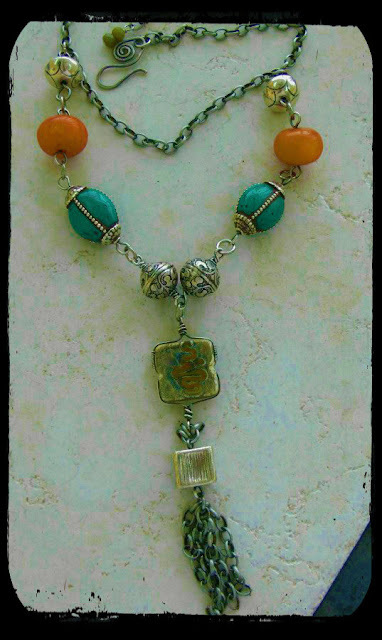 Lori, you made SO MANY stunning pieces for this bead soup!! It's hard to pick a favorite. Thanks for everything and for being my 100th follower! First, thank you so much for providing this great opportunity to stretch beyond my self imposed beading boundaries, I had so much fun! Second, you are incredibly talented, your soup designs are beautiful. 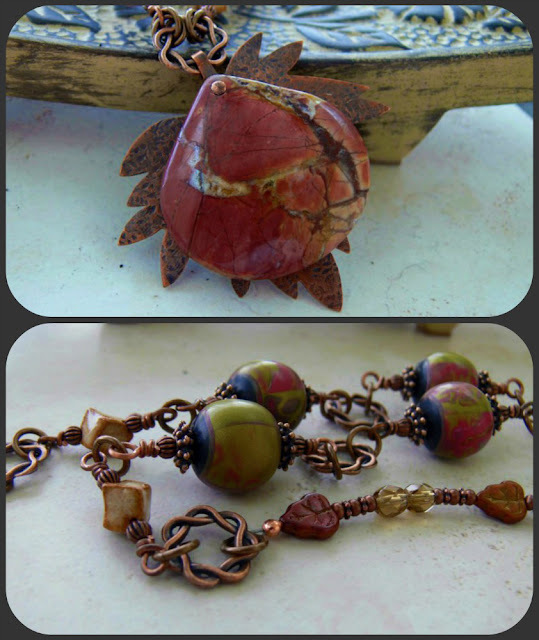 My favorite is the necklace using Marcie's brown and copper; I love that focal and copper is my new favorite. I would love to wear this necklace to my daughter's wedding, it is stunning! Best wishes and happy hopping today. Cheers! Thank you so much Lori for hosting this. I love all the new discoveries. I adore that first necklace, the frame with the lace. It is beautiful- the colors are great, the necklace perfectly compliments the focal. HOLY COW!!! You excelled! You created so many WONDERFUL pieces. I love them all. Thank you so much for pulling this together for all of us. It is so much fun. 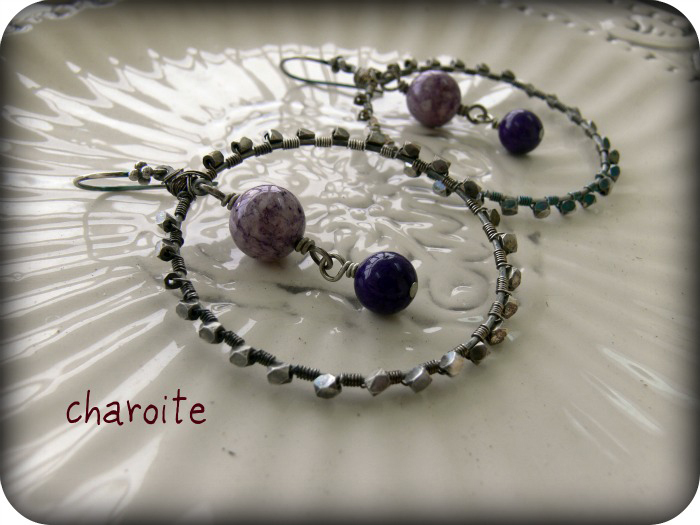 Wow, Lori, you raised the bar with these lovely pieces..I love the riveted stone, it really caught my eye. Lori, Delicious. All of them. I love the way you put tiny seed beads to adorn the clasp, The way you wire wrapped those square beads, those tiny darling earrings and the zipper pullers. When you give those zipper puller to some one it says, love each day, live life fully.. I even care when you pull up those zippers. Hey, no pun intended. Beautiful. and thank you. Dita. Wow, simply WOW! You leave me speechless!!! All I can say is Wow!! Simply amazing work!!!! The necklace with the beaded frame has such a romantic feel!. 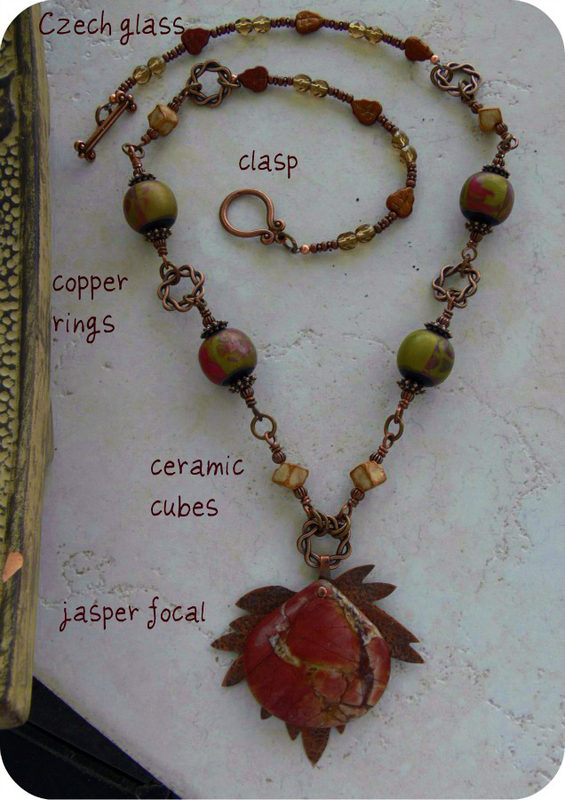 Love the copper and jasper focal that you made from the second soup Marcie sent you. Rebecca sent you a wonderful soup also - love the focal you made from the brass leaf. Everything you made is scrumptious! Stunning is what comes to mind when I see all of your beautiful work & creativity!! They are all so different, that it's impossible to pick a favorite! Congratulations on another BSBP gone well! Is it time for pie yet?? I love, love LOVE what you've done here; with all of the soups. You have been so creative and really pushed the envelope here! Really stunning throughout, I'm honestly a bit lost for words....your use of fibre, using beads and elements in unexpected way - it's just fantastic. Your vintage lacy frame necklace is outstanding - I can't imagine just how long it would have taken you to wire all those pearls! And all of those earrings.....I think the Moogins are my favourites! Gorgeous. I love the shade of blue. I am going to be returning to this page again and again! Lori, I think Hope has said that she was in awe of all that you accomplished with all that you have had on your plate as of late, and I will mirror that comment. All of the pieces you created are awesome. I love the antique lace that you added to your first piece with the dangle pearls very vintage and romantic. The love how riveted the jasper focal and how that piece came together, very much my style and color palette fav's. I too want to learn how to wire wrap like you did with the hoop earrings!! So much fun! POW... right in the kisser... is what I got when arriving here. Just amazing all the beautiful designs and creations. You must have burned the midnight oil for about a month. Amazing!! Thanks for making this blog party a fun one. It was my 1st time entering. You held my hand the whole time and I really appreciated that. Whatever questions I had going around in my head were answered by your update e-mails. Gorgeous jewellery! I was going to name my favourites, but while scrolling down I got more and more of them. *lol* Fab job! And thank you so much for making this BSBP happen! Think I like what you did with the brown earth ton focal the best.. the copper baking really sets it off! OMG!!! You are just amazing Lori! Not only for hosting this ginourmous event but for taking the time and love to make beautiful pieces with almost every bead that was sent to you. I honestly have no clue how you did all of that in so many fantastic creations with all you have going on. I think you may have been working in your sleep. I honestly couldn't pick a favorite because they all have so much personality and you in them. I am truly in awe! Wow Lori! Where on earth do I start? You have made so many gorgeous pieces, and your attention to detail is wonderful. I love the vintage crystals, especially that amzing pendant. All the wire wrapping must have taken you hours. I love everything you've made. 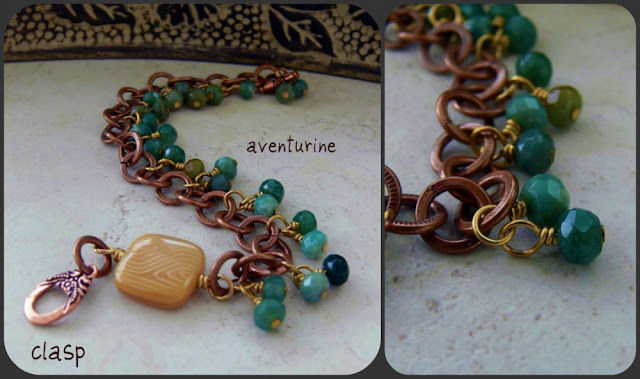 The pendant with the heart button is so lovely, and the aventurine bracelet looks so tactile. Thank you so much for such a great party, for all your hard work and generousity. OMG Lori! You are beadwork-aholic! You did so much great work!!!!! I love the necklace with the green "dangles" ,-) best. Holy cow Lori - you are completely amazing! I couldn't pick a favorite if I wanted to 'cause they are all wonderful! The colors are so vivid, and you used so many unique techniques, I am completely bowled over. Fantastic! Thank you again so much for hosting this great event - I'm off to hop! Holy macaroni Lori! Wow! I am floored with your creativity and talent. Just amazing! Thank you so very much for hosting yet another spectacular hop! You're the best! Wow Lori! I'm amazed at all the beautiful things that you designed. My favorite is the necklace with the Jasper focal. Those are my colors, and you did an awesome job putting that together. Love everything you did! Thanks again for hosting such an awesome party! They are all gorgeous but I do have to say that you really rocked that copper and brown necklace. It has to be my favorite. WOW! You are the Soup Queen, so I don't know why I'm surprised! I just didn't realize you were working with SO MANY ingredients. WHEW! You have been busy! Everything is lovely! I can't pick a favorite, there are too many. Just want to THANK YOU again for a job well done with the 5th bead soup hop. Nice and fun and perfectly executed, as usual! Wowie kazowie! I love how you wire wrapped the beads to the clasp. And the frame with lace is brilliant. A lot of creative thinking. Beautiful work. Lori, first of all thank you for putting this all together. I'm sure it wasn't easy especially when you weren't feeling well, so thank you, thank you, thank you! You made some absolutely fabulous pieces! I love all of your designs...each one is unique and creative. You are very talented! You truly outdid yourself this time Lori! These are the best things I have ever seen you make, and I always love your design! I think the vintage ones are so inspired. I have some of those same frames from Miss Marcie and they are gorgeous. I just never knew what to do with them. And that last one with the leaf and the silk is really thinking outside the box. Very proud of you for doing all of this for two soups and in record time! Congratulations on another successful hop. I will hopefully have time to start looking at all the pretties next week! Enjoy the day. First off, thank you for hosting such a fun challenge! I'm having a great time meeting new people and seeing what they made. First I want to say THANK-YOU for hosting this wonderful event. It's my first Bead Soup and I hope I can come back for many more. Second, the pieces you made are fab. I love all the elements you used from your partners. This is an amazing event, being able to see all the creativity just oozing from everyone is wonderful. Thanks again, I'll be back for the summer soup if you'll have me. WOW! I am not even sure I know what to say besides AMAZING! I love all of your pieces and would wear them all. I don't know how you found the time to do this much work, you must not sleep. I have really enjoyed this entire process and look foward to the next. Thanks again for being such a wonderful hostess. Thank you for visiting my blog! Your pieces are all gorgeous but I mostly LOVE the one with the jasper pendant and leaf. Are you now hooked on riveting? Oh my! You have been busy! I will just pick one of the pieces, well, two. I love the first earrings. Simple to look but complex to make. 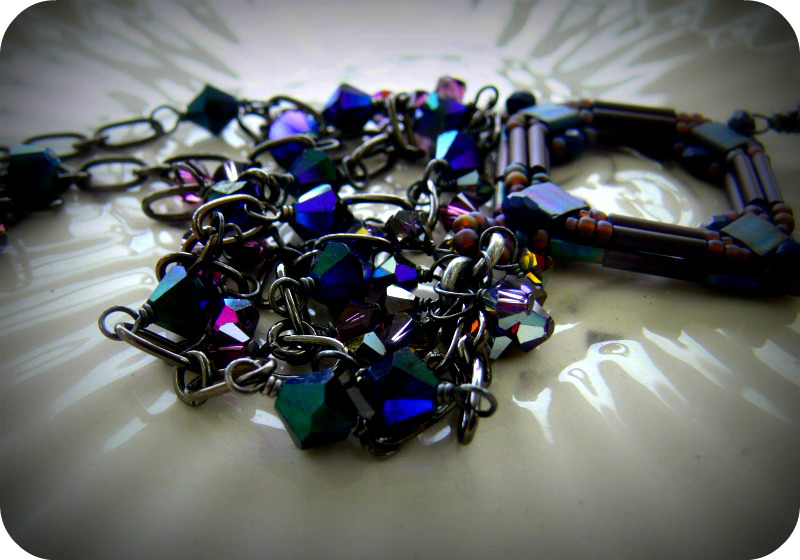 And the second one is the bracelet with the triangular clasp and chaorite spare beads you had. Love the colours. 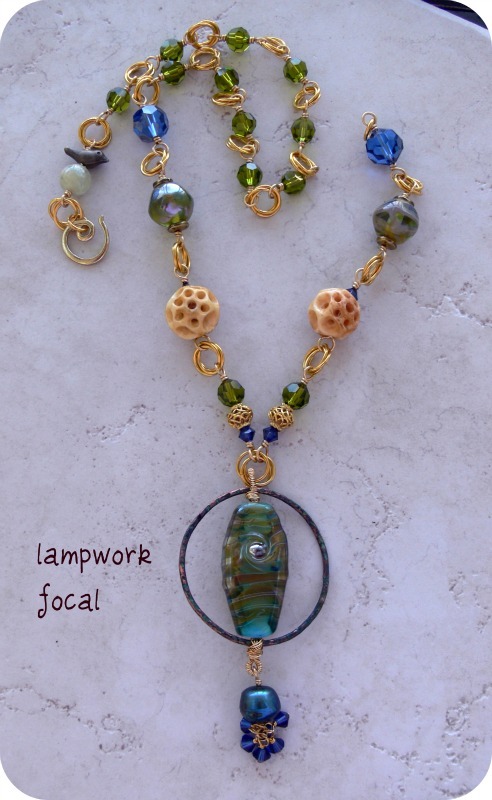 But then my all fav is the necklace with the square lampwork bead. Love that one! I am not too kin on the first piece with the fabric, but I would say that you have been working hard on your pieces. Wow, I love all your pieces and so many of them! I really love your green necklace that you used the ceramic heart and the leaf. And Lori, I want to thank you for all your hard work on putting together this blog hop. This is the second time I have participated and I really enjoy it. I really like them all, but I think my favorites would be the necklace with the 3 wire leaves and the bracelet with the polymer clay flowers. I love the colors you used in them and the designs. Wonderful job with all the pieces. I also love that riveted focal with the leaf and jasper. Wow! Great designs!!! You guys are soooo talented! This is the first time I've heard of Bead Soup Blog Party and am so glad to have found it. Perhaps I can participate in the next one. Is there a place to join up? Wow Lori! You sure had a lot to work with and you certainly delivered! I would wear everything you made. And thank you for hosting bead soup again! Zach picked the sweetest little beads. I love your usual style, but you proved your creativity by making the vintage inspired pieces. I love them! Thank you for a another great party! Good Lord Lori! I was struggling with 1 soup and you made all that! You are amazing and again this was fun. Stretched me SO far out of my normal pink and brown comfort zone into blue :-) Funny because this week all I have been shopping for is blue and green beads, hmmm. I am in love with the first necklace! The lace on the pendant and all those pearls!!!! oooooh! Wow!!! I can't believe with everything you have going on between blogging, organizing these events, and health problems you had the time to create so many gorgeous pieces!!!! Thanks for the lovely ride today, Lori. Loved visiting many, many blogs and seeing the lovely designs. Hoping to participate next year. Best wishes to you. WOW my friend, WOW. Love them all but I want the earrings. Lori,You are a design goddess. Every piece is a work of art. I would wear every piece. You are also very prolific. You made enough jewelry to open a gallery. And I did not sign up for the party because I did not think I had the time. Shame on me. Thank you for a great post I will hop back to admire your work again and again. Brilliant work - wonderful designs - so much to look at I'll have to bookmark this entry so I can return a few times just to really take it all in. Thanks again for being our Queen of the Hop! Wow, Lori, what an amazing collection of pieces...I've looked at them a few times and I see something new each time. Ok seriously? I can't even freaking believe you have been feeling like crap and you make not one or two amazing pieces, but like 500 amazing pieces. I adore every single piece. Gluing that lace was brilliant and kind of scary. It turned out amazing. Wow Lori! it seems you have created a wonderful collection from the two bead soups. Each piece is just so pretty. Love the earrins and zipper pulls...simply cute. And very nice to see the way you have labeled the pieces...indeed very creative. Thanks a ton for all your hardwork for the bead soup parties. Glad to be a part of the party. Wonderful pieces! I really love the leafy pendant with the green fringe! First, I'm so glad that Zack snagged those little shoes!! I would have too! My goodness all of your pieces are gorgeous!! You have been busy, busy!! Beautifully done!! I'm too overwhelmed by everything you made, I can't possibly pick a favorite, but I do love how you accented the beaded frame with the lace! Very clever! Thank you so much for yet again hosting such a wonderful hop! This must have felt like Christmas for you. I cannot even imagine how fun this was. I kept thinking I found a favorite and then I kept reading. They are all my favorites. Your skill and creativity are just out of this world. Very prolific, and diverse collection, Lori! My favorite is the necklace with the leaf/ceramic button collage. Your are a whiz with wire and it was fun to see all the gorgeous things you made! Oh my goodness you really are amazing Lori. Such a great host for the nead parties which I always look forward to no matter if I am a participant or not. I love everything you made. 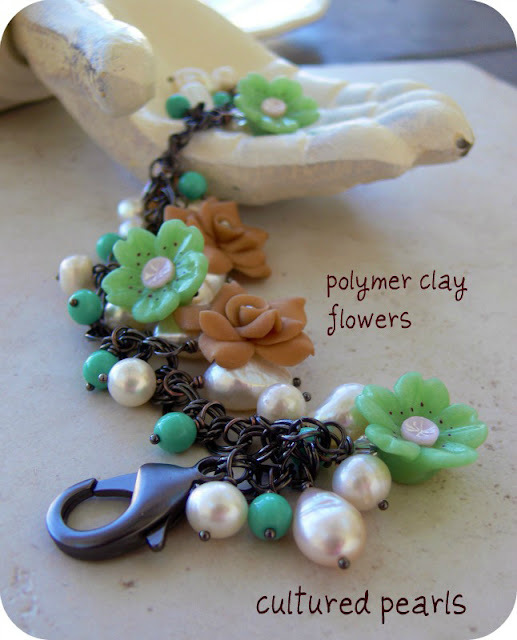 My favorite is definitely the girly bracelet with the pearls and green polymer clay flowers. How lovely and feminine. that was just amazing...and convinces me that I have to partake in the next swap!!! Oh my gosh!! Where to start? What amazing pieces you made. I can't even begin to comment on all those gorgeous pieces. Just beautiful! I hope someday I can do that. You're so talented. Oh, Lori! All these creations and organizing the blog hop as well - so impressive! Such detail and such a gorgeous blend of colors. I'm already looking forward to summer's soup! I cannot believe how much jewelry you made with the items you received! wow! and all great of course, and I agree with the kid.. the shoes are great.. I would mug you for those shoes. I want the shoes!!! Wow, you received some yummy soup mix and did a show stopping number with it. 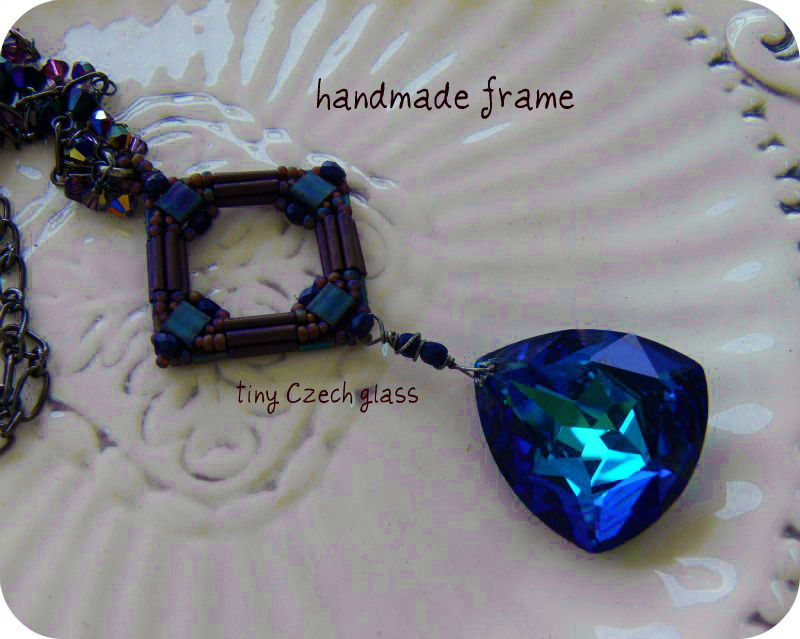 I love all the creations, especially your Frame necklace. Thanks for all you do. Lori, I has a chance to go back and read everything, you really did a lot of great work...so much yummy detail, thanks for sharing your talents. Wowie! You must have been so inspired, I am amazed at your output! I am late to the party, but excited to get browsing. Awesome job once again Lori! Cheers! Wow, Lori what a great job you've done! I love all the pieces you made and it gives me so much inspiration!!!! Thank you so much for the wonderful bead soup blog party, I loved it! Wow! You have so many different pieces in this post, its almost impossible to figure out where to start with the comments! You've definitely showcased your versatility in design! I loved the way you dealt with 'fixing' the orientation of the square bead. What a clever idea - and beautifully executed. Very, very nice! OMG Lori! These pieces are absolutely magnificent! I can tell how inspired you were by your partners work! I can't believe how many pieces you created! Wow!! Oh. my. goodness. You. Amazing. Full. Sentences. Incapable. Awed. I love that you just dove right in. And used up all the soup(s)! Earrings earring earrings. A girl can never ever have too many earrings. Such an inspiration to look at the prettiness of your creations. Thank you so much for hosting this! LOVE YOU!!! I'm finally here!! I think you did a great job with the pieces I sent you! I'm especially in love with the copper/jasper piece. 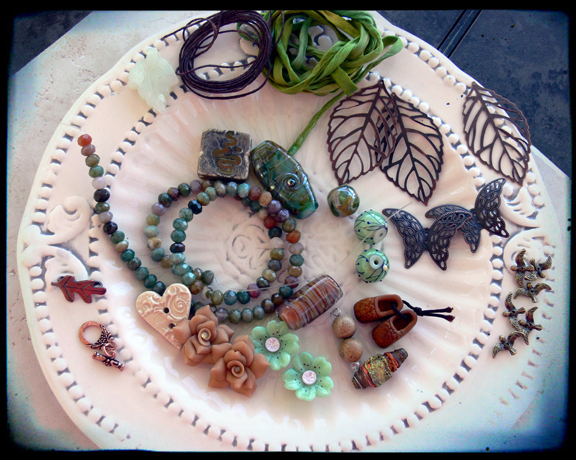 Thanks for a wonderful bead soup Lori, tons of fun as always! Beautiful pieces Lori! you were busy! 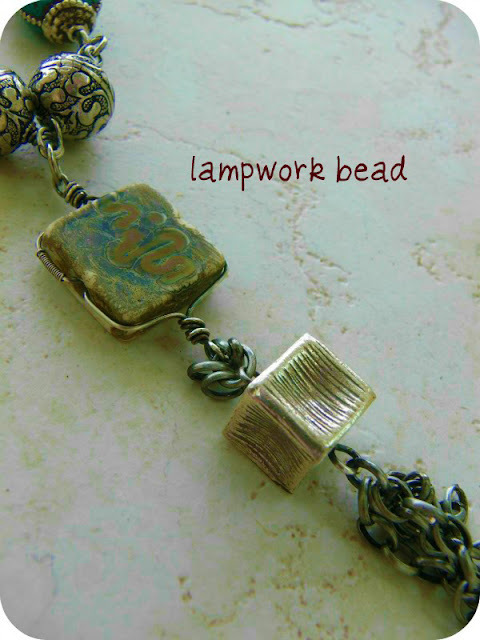 I love how you wire wrapped the square lampwork bead. Lovely pieces all. 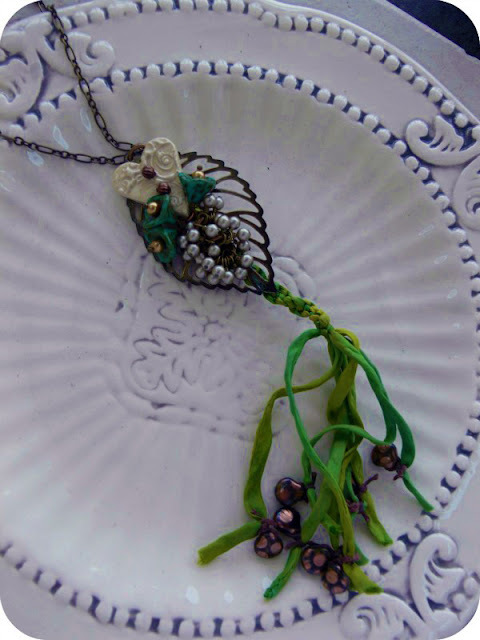 Love all your pieces - I love seeing those filigree leaves as I'm making a long necklace with them right now. cool to see another way to use them! Lori, your designs are awesome! 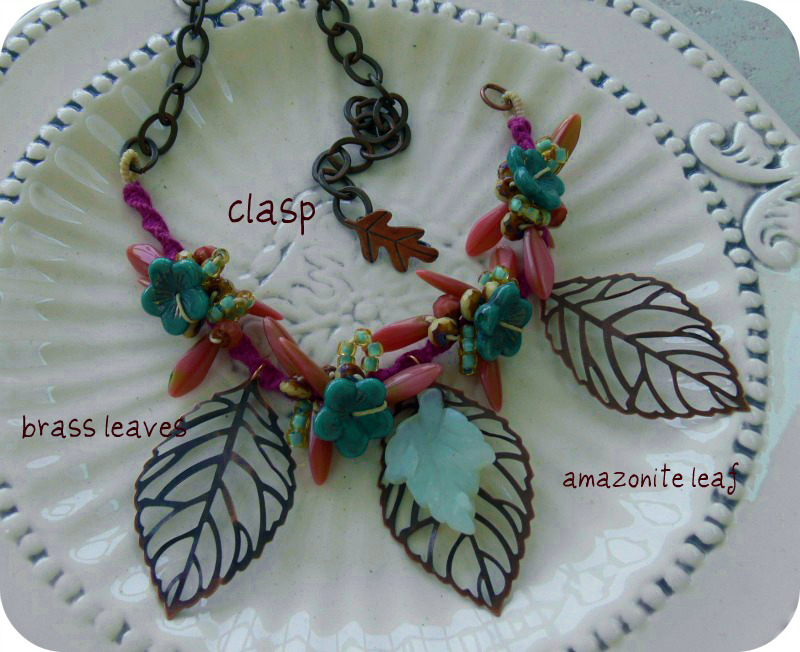 My favorite is the 3 leaves necklace with that leaf clasp. Thanks so much for hosting! Lori - You weren't kidding when you said you made a lot of earrings! They are all so pretty! As I was scrolling through the pieces you made, each new picture made me say "Wow"! You are so talented at wirework. All your turns and twists look great. Thanks again for all you do on the Blog Party. Lori, your creations are absolutely amazing! I love them all! You are so creative and so good at what you do! I can't wait to be in the next BSBP!!! Amazing Lori! That was a lot of work, and your labors paid off in beautiful pieces. My favorite would be the 3 leaf necklace. Thanks for your kind comments on my blog. That's just astounding, Lori! No wonder you've been tired! What beautiful, totally creative pieces you've made. An inspiration to all! Lori, I never cease to be amazed by the things that you create and this is no exception! Everything is just gorgeous! Thank you for sharing with us! Wow! I am so glad that I am taking my time and working systematically through everyone's blogs. I am reading and looking and reading and looking. It is wonderful. But, Miss Lori, I would say to your catalog of beautiful jewelry, if you want comments, then you shouldn't leave us speechless. I really don't know what to say. I am just flabbergasted at everything. It is so beautiful and so....so....so..... I'm at a loss. I knew whatever you made would be wonderful, but wow! I will be looking at this for a while, because just like the best big old pot of bead soup, you just can't digest it all at once. Thank you so much for hosting these parties. I don't know what your personal motivation is, but you give so much to the rest of us when you do it. I only hope you get as much fulfillment from it as we do. And don't worry when things don't go just as you planned.....my Mom has always told us the old saying, "If you want to make God laugh, tell him your plans." I think it has been a huge success and I am so happy to have been a small part of it. Lori, you're soooooo talented! I love every piece you made! The colors and beads and especially the frames are stunning. What a great job you did! This is such an amazing idea!!! I really love how you bring people together like that!!! Not only did you put together a great swap/hop, but the pieces that you made rock. I am so happy I got to participate and am eagerly looking forward to the next blog party! Barely getting around to looking at all the wonderful creations, Lori. Your creations are exquisite and you made so many...WOW! I am always in awe of what you create! You had some seriously fun beads and things to work with, too! Amazingly gorgeous jewelry! But, I always love what you make! Wow! Lori these are spectacular! That Swarovski pendant you had hidden in your stash is just gorgeous! I love that you can do so many different styles, Lori! They are all very pretty, but I have to say that I like the "earthy" necklace the best. Those are "my" colors! lol! Thank you for including me in this soup...I have enjoyed my experience very much! I probably won't join another one (for various reasons, none of which have to do with you...just too much pressure right now, for one thing.) ;o) But I look forward to hopping along to see everyone else's projects next time! Holy cow, woman! Not only did you host the party, write the invitations, and decorate the house, you cooked up a whole danged smorgasbord of delicious jewelry. AND you proved why we have to have a good, healthy stash of beads hoarded away. I will use this an example if Pat ever loses his mind and asks why I need another bead (or hundred)! Over the last month I've read you say you say you aren't innovative but these pieces and the hop itself say otherwise. These are some really beautiful pieces of jewelry. Sometimes the innovation comes in surrounding yourself in creativity - after hopping all 200 blogs I can say with certainty you have done just that! Thank you once again for inviting me to play! I look forward to this summer! Oh my! You sure have been busy! Such an amazing array of beautiful creations! Makes me feel like a slacker for only creating 1 piece. ;-) Thank you so much for organizing this! Had so much fun even if I'm a little late to the party. LOVE all of your work! Colours really work & the wire-work..just georgeous!! Thanks for the chance to participate...will definitely sign up for the next one!! I am amazed at what you created! Not to mention the jewelry :) Thank you for creating such a fun blog hop for all of us, I can't imagine the hard work you put into it, and then you were able to create such amazing pieces. 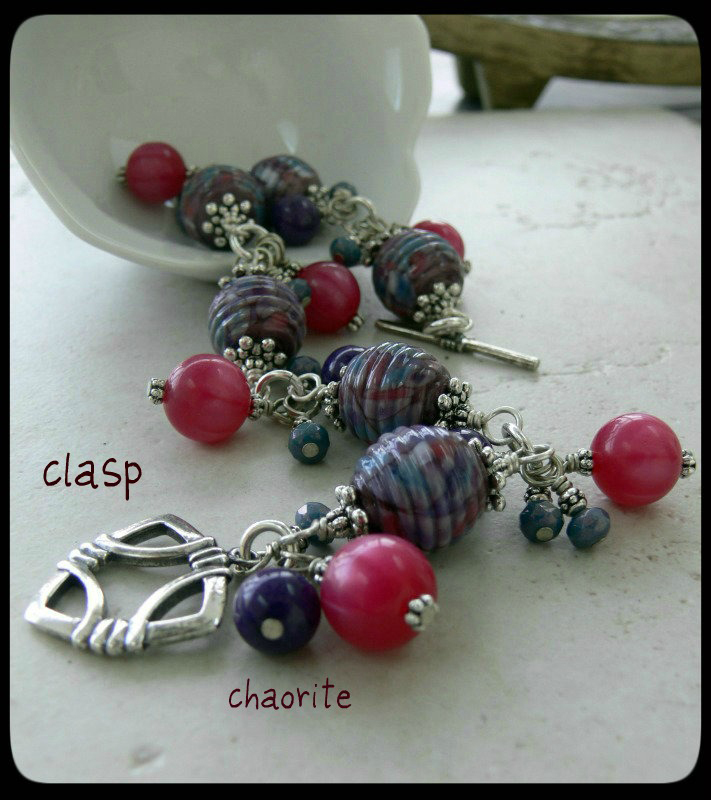 I have to say that my favorite is probably the lampwork bracelet with the dangles, I adore dangles! LOL!